This November will be the 1st anniversary of The Thames Lido. Since its re-opening in 2017, the Lido Spa and Restaurant has become a destination spot in the small commuter town of Reading, drawing new audiences to the area and garnering a reputation for delicious food and a welcoming atmosphere. To celebrate the Lido’s 1st birthday we are happy to share some of the outstanding reviews from the last year. The Thames Lido is an urban oasis for al fresco swimming, dining and socialising. A short walking distance from central Reading, the site has a unique position overlooking the River Thames. 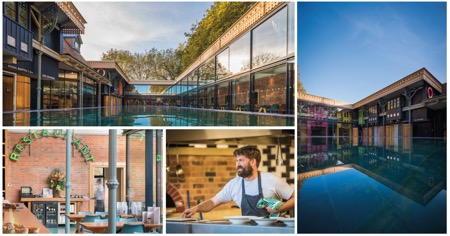 The team behind the award-winning Lido in Bristol spent three years painstakingly renovating the neglected King’s Meadow swimming pool. In the Lido’s restaurant executive chef Freddy Bird draws on Spanish, Mediterranean and Middle Eastern influences to create a daily-changing menu of sharing dishes cooked over fire.